Johannesburg, 7 August 2018 – Today hundreds of activists from the Treatment Action Campaign (TAC) and Corruption Watch marched to the Gauteng Provincial Legislature to demand that Qedani Mahlangu and Brian Hlongwa be removed from their positions in the ANC, and in the case of Hlongwa, as a MPL and ANC Chief whip in the Gauteng legislature. 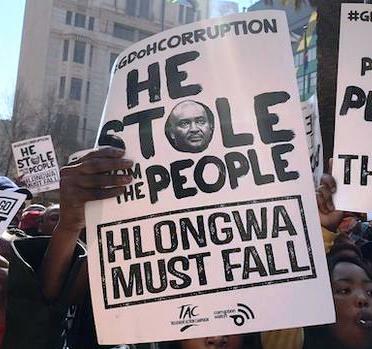 Mahlangu and Hlongwa were re-elected to the ANC’s Gauteng Provincial leadership despite being accused of gross negligence in the case of Mahlangu and facilitating rampant corruption in Hlongwa’s case. Both former MEC’s of Health have contributed to the collapse of the Gauteng health system. Under their watch the department has been riddled with pervasive corruption, gross negligence and there has been a dire lack of accountability. The citizen activists demanded that Premier David Makhura take urgent action to ensure accountability for the many lives lost and money squandered from the public purse. In recent weeks, the media exposed the looting of public funds and resources on a mass scale in the Gauteng health system during Brian Hlongwa’s tenure as MEC for Health. The recently publicised ‘Special Investigating Unit’ report uncovered more than R1.2 billion in unauthorised, irregular, fruitless and wasteful expenditure. TAC and Corruption Watch firmly believe that the current health system collapse is a direct result of the weakening of accountability at that time. Under his leadership, it is evident that a culture of corruption was developed. The consequences of this is death and suffering for poor people. Qedani Mahlangu refused to accept responsibility for causing the worst tragedy this country has witnessed since the dawn of democracy. The arbitration award handed down by Moseneke required the current MEC of Health Gwen Ramokgopa to produce a turnaround plan within 30 days that would outline how she would improve mental healthcare services in the province. Part of this plan should have included a strategy of engagement with interested parties such as patient groups and civil society. To date this plan has not been published. The dysfunction in Gauteng is claiming lives and leading to widespread suffering. Former Health MECs Brian Hlongwa and Qedani Mahlangu must be held accountable for their failings. However, instead of facing the consequences of their actions they have been re-elected into new positions. This is an absolute disgrace. It is an affront to the poor people who have suffered and lost their lives at the hands of a failing health system. “Both should be criminally charged, prosecuted and jailed. Instead the ANC has rewarded them with seats on its provincial executive committee. If the ANC does not care to impose consequences on these people, rest assured that come 2019, the voters will impose consequences on it,” she added. 1. On 28 June 2018 a damning TAC report was published outlining the dysfunction in the Gauteng health system. The report was sent to MEC Gwen Ramokgopa in May 2018. The MEC has since committed to a one hour meeting to discuss the contents of this thorough 19 page report. 2. On 21 June 2018 SECTION27, TAC and Corruption Watch made public a Special Investigating Unit (SIU) report that documents widespread corruption and gross financial misconduct totalling some R1,2 billion in the Gauteng Department of Health (GDH) in the period 2006-2010.